Genius ways to have a more organized, calm, happy life. Oh, yeah. My life would be so much easier if I were super-organized. I'm not so bad in that department, but I have plenty of those can't-find-my-keys freakouts, a towering pile o' crap on my kitchen counter, and a nagging feeling that very little is under control. 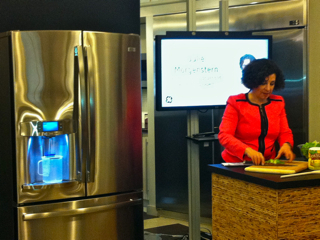 Recently, I attended a GE event for their new French-Door Refrigerator. It's above and by all means, drool. 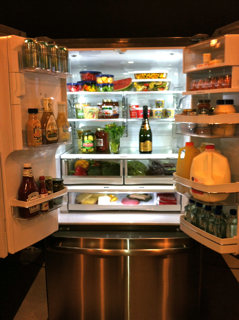 Not only is it all sorts of organized, it's got serious technology including a super-powered filtration system, a hot-water dispenser and TwinChill to maintain different temperatures in the food and freezer sections so nothing gets too cold or soggy. 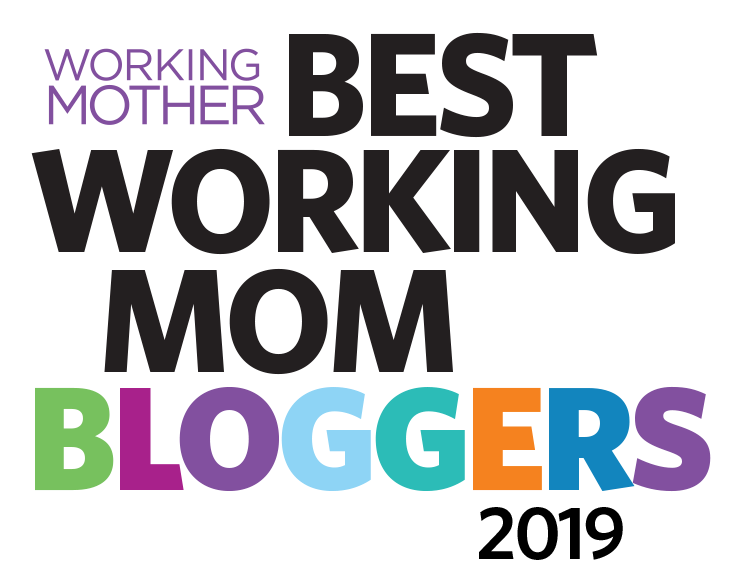 There were a few guest speakers at the event including Julie Morgenstern, a productivity strategist and New York Times bestselling author of Time Management from the Inside Out and Never Check E-mail In The Morning. Here's Julie prepping salad while the Hands-free Autofill does its thing. I'd heard Julie speak years ago when I worked at Glamour magazine and she gave a seminar. I've never forgotten some of her tips, including maximizing morning time for doing work because your brain is at peak productivity level. Not only did Julie agree to answer questions for me, she validated my beloved paper planner, which I cling to for dear life. Julie's partnered with Levenger to create The Circa Balanced Life Planner, a total time-management system that, as Julie describes it, is based on the way we think and our natural habits. "Studies have shown that people still favor paper planners," she says. Amen! • Stick with one kind of planner. "If you have things in multiple places—the wall calendar in kitchen, the app on iPhone, your to-do list—it's a recipe for confusion, doubt and inefficiency." • End every day by planning for tomorrow plus two. "One of the most common time-wasting mistakes is waiting till the morning of to plan for the day. By that point, it's too late—if there's a schedule conflict it's too late to manager your way out of it, if there's something you don't want to do you're stuck. But if you plan for tomorrow plus two, a three-day arc, you have context—you can see what's coming up, prioritize, rearrange smartly and make better choices. Plus you can carve out breathing room! If you're reading this on Tuesday, for example, tonight plan for Wednesday, Thursday and Friday." • Batch wherever possible. "Group your appointments, errands and obligations to masterfully maximize time. Maybe this morning you could have sat and played with your kid. But you had one appointment, which killed the entire morning. If you batch these things, you can leave yourself large blocks of downtime for fun, family or yourself." • Keep paper where you refer to it. "If you tend to make calls and fill out forms in the kitchen, that's where you should store your paperwork. Look to where piles are and create a home information center. 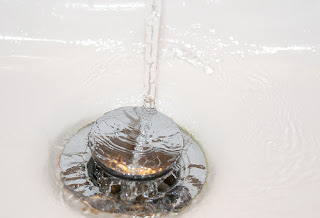 It's where you want to work—go with your natural habits." • Have a simple system. "Designate a file box, file drawer or hefty accordion file for papers, depending on the volume. Then create a color-coding system, which makes filing clear and fun. Color communicates more quickly than words do! For example, use green for financial documents, blue for vital documents, orange for fun activities. You can also separate adult files and kid files—just use a different color family. For example, Max info can be in fluorescent." • Make a place for everything. "Busy parents often don't have a core system, so putting things away isn't easy. You want to go through each room and make sure there's a place for everything, so maintenance is a breeze. That means things are accessible and well labeled and what's in that room is what you use. 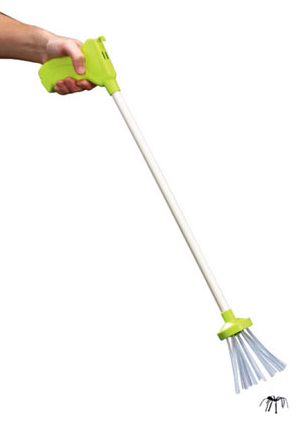 No matter how messy the room gets or chaotic the day, cleanup will take no longer than five minutes, tops. It takes a day to a day and a half per room to organize a room, but it's worth the time investment." • Set up stuff for its next use. "Before you leave a room, set everything back in its spot. So when you come in, there's the Scotch tape!" • Label, label, label. "Parents think they have to nag or force kids to clean up. But kids love order. In kindergarten, the teacher just announces it's clean up time, and the children go to it. Parents should shift their mindset—don't think of cleanup as punishment. The world's chaotic enough for kids. Make sure things are labeled with pictures if a child doesn't read, and have them participate. It's something any child can do, and makes them feel like they're participating and contributing. It's also grounding; the more chaotic our world gets, the more we gravitate toward rearranging our bookshelves!" • Plan to recharge daily. "Moms like to joke that we need a two-month vacation. But we wouldn't need it if we just gave ourselves daily recharge moments. Have a short list of things that quickly restore you, rejuvenate you and recharge you in the most efficient way possible. Whatever it is—going for a drive, taking a bath, calling a friend. It's like a cell phone that you need to recharge every day. Without it, you're not recharging the battery—and you're not as good, as patient, as smart or as accurate. Think about this: You lose two to three hours a day of inefficiency when you're operating on exhaustion. • Plan to recharge weekly, too. "This involves a larger amount of time, but recharges you like nobody's business! Make a list of stuff to do, then take that time for yourself. "May we live life not by our fears, but by our hopes." I read those words in a prayer book recently, and for the rest of the service I could think of nothing else. This, to me, is a perfect prayer for those of us raising kids with special needs. I don't pray a whole lot but over the years, I've asked God to help Max along: Let him walk, let him talk, let him be cognitively OK, let other kids treat him well and not be mean, let the seizures stay away. I don't have anything specific I say; usually, I just slip words into services or think them at night, when I'm lying in bed. I was never one to ask God for much; mostly, I'd ask that my family stay healthy and safe. Then Max came along, and praying took on a new intensity. 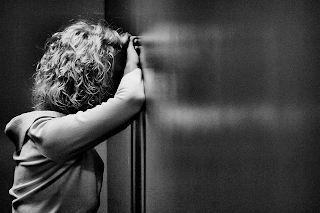 At services, I realized: I have never once prayed to God to help me. I have added this one to my prayers. "Happy summer" may seem like an oxymoron if you are up to your ears in kids home from school. I love my kids! I love when they're not home! Start, camp, start! On Saturday, I begged Dave to take the kids for ice-cream. Then I hung out on the deck, alone, something I hardly ever do. My problem with trying to veg in our house is that there's always something that needs cleaning or picking up or organizing or de-gunking. I just can't zone out. In the winter, I sometimes go to the Whole Foods food court just to clear my mind. 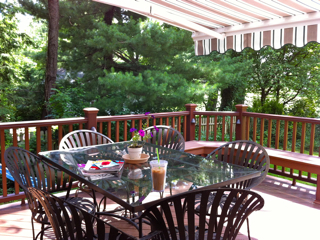 In summer, though, I have our deck, where I'm forced to be at one with my magazines and coffee. I mean, I did have to jump up and dab paint on some rust spots on a chair, but then I settled down and chilled. I made an iced coffee frappe as a treat; the International Delight people sent me a lovely Summer Survival Kit and recipes, including this one. 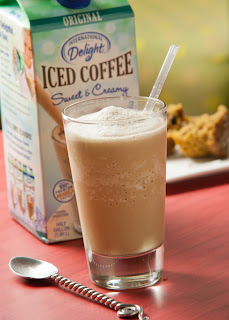 If you have a thing for iced coffee, as I do, it's nirvana-like. Here's how to make it and don't blame me for your addiction, k? • Convince husband to remove children from home and drive away. • Combine all ingredients in a blender. • Blend until thick and smooth. • Go sit outside and enjoy the drink... and the peace. Ever have to stifle laughter around your kid because you know you shouldn't be cracking up over something they've done but it's beyond funny? That's what happened the other day when Sabrina came home with a pamphlet her class had put together. 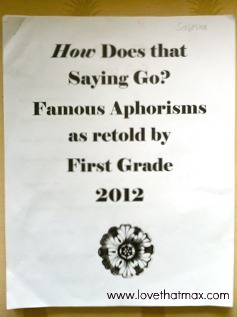 Her teacher had written out the beginning parts of well-known sayings, and left the endings blank for kids to fill in. I was thrilled to see the ones Sabrina had gotten right, but I was even more thrilled by the ones she didn't get right, starting with "You can pick your friends but you can't pick your nose." BWAHHHHHHH HA HA HA HA HA! Better to be safe than a tiger. Children should be seen and not in the night. Look before you walk on water. A picture is worth a thousand dollars. Too many cooks spoil the whole table. Too many cooks spoil the orange juice. An apple a day will make you throw up. You can lead a horse to water, but you can't make him tap dance. No use crying over spilt soup. The grass is always greener on the golf course. Good news travels on TV. An apple a day keeps the teachers away. If at first you don't succeed you get consequences. Children should be seen and not at school. Better to be safe than a frog. A bird in the hand is dinner. A bird in the hand is awful. A bird in the hand is would be cool. A bird in the hand is a pet. A bird in the hand is wings. A bird in the hand is awesome. Max has this fascination/fear thing with roller coasters. He's never been on one, but when we're at an amusement park he'll stand and stare at them, mesmerized, then shake his head and say "Nooooooo!" Then I have to say "Not for Max!" to reassure him that we won't be taking him on one. Today, we visited Max's physiatrist after his physical therapist at school expressed concern about his hip, and how it might be forcing his right foot to turn inward. The foot that he got serial casted last summer. I talked my way into an a.s.a.p. appointment because I was so concerned. Max's walking is a miracle (I do not use that word lightly) and anything that threatens it is A Big Deal. Not to worry, the physiatrist said after he examined Max, and I just about swooned with relief. Max's hip looked fine to him, and he said he was walking well. The doc was especially impressed by how far along Max's comprehension had come, and his ability to stay calm—as a toddler, Max wailed his heart out at these appointments. Score 1 for Max, 0 for cerebral palsy. We're back home. Max is playing with a toy truck, and I'm filling out an application for long-term care insurance; Dave and I are considering it. It's the usual form mumbo-jumbo. Then I get to a list where I have to make a check if I have one of the following: multiple sclerosis, Parkinson's, Alzheimer's, cerebral palsy. A note in small type below the list says that if I've checked any of the above, I shouldn't continue filing out the form. 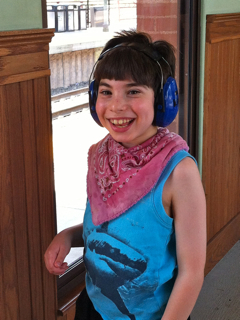 At age 9, Max would not eligible for this insurance because he has a condition that the company considers to be as degenerative as Parkinson's and Alzheimer's. Max asks if I'll take him on the train. He doesn't have school, I'm off from work so sure, why not? 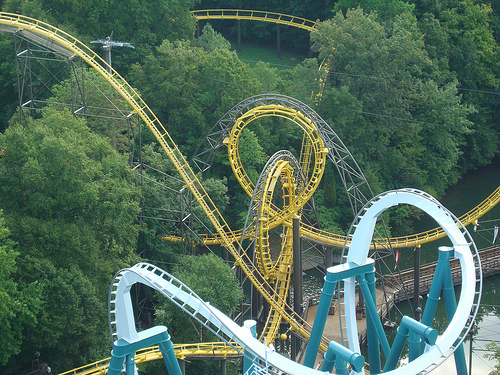 We drive to the parking lot, buy round-trip tickets and settle in for a joy ride. "Pardon me, do you mind if I ask whether you like those headphones?" 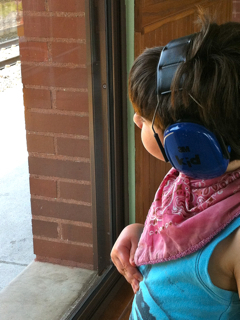 a woman seated behind us asks about the noise-reduction headphones Max has on. Turns out she's a local occupational therapist. I've been on the hunt for a new one for a year. We talk. She's worked with kids who have CP, she mentions some innovative-sounding techniques, she seems really nice. I'm not a big believer in fate, but I am a big believer in the power of coincidences. "Max, would you like her to come play with you?" I ask. Max eyeballs her. "Eee-yah!" he says. I get her card and we get off the train. I'm excited. There is a big staircase at the station that'll take us to the other side for the return trip home. A conductor on break glances at the braces on Max's feet and gives him a pitiful look. "Awww, honey," she says. "Do you need an elevator?" "Actually, he can handle stairs pretty well," I tell her. I know she only means well, but I can't stand the pity. Max keeps looking down the track for a glimmer of train. Soon enough, he spots it and he squeals. Few things make me feel as good as that squeal. We get on, grab seats and he contentedly stares out the window till we're at our stop. As we get off, a crew person helps Max down. Max gives him a high-five. The two of us head back to the car, happy. 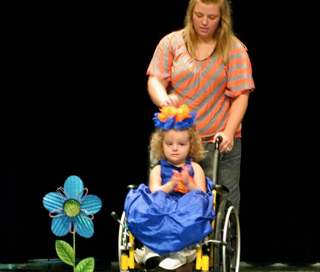 A beautiful thing happened in Lufkin, Texas last weekend: a pageant for kids with special needs. Called, in fact, I Am Beautiful. Tots, kids and young adults participated, 20 girls and three boys. They had a range of disabilities—Down syndrome, autism, cerebral palsy, Turner syndrome—but they all had one thing in common: awesomeness. An awesomeness the world doesn't always see. And, of course, beauty. Lots and lots of it. I'm usually not one for the spectacle of pageants. But I am all for spreading awareness about how kids with special needs deserve to be treated like any other kids—and for making our kids feel good about themselves. This event scored on both‚ and it was totally low-key (Toddlers & Tiaras, it wasn't). While there are pageants around the country for people with disabilities, like Miss Amazing and Ms. Wheelchair USA, ones for kids with disabilities are rare. 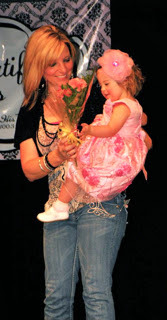 I Am Beautiful is the brainchild of Bonnie Williams, a mom who's entered her 10-month-old in local pageants. 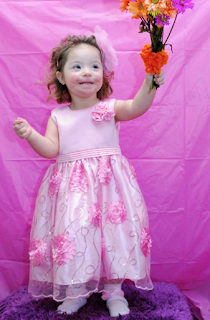 "At my baby's first pageant in February, I saw a friend in the audience who has a daughter with special needs," Bonnie recalls. "This little girl is beyond beautiful and has so much personality. I thought right then and there this is what I need to do for special needs kids." And so Bonnie put together the whole shebang, gathering donations from the community and local businesses (participation was free) and booking space at a high school. Kids showed up dressed in their finest, one parent and child traveling from 100 miles away. 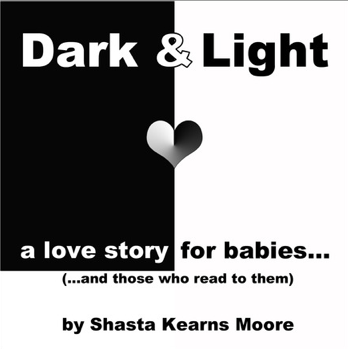 Clarrissa Lott entered her son Jacob, 4 (above and below, left). "I thought it would be fun to dress him up and show him off," she says. "He was struck with a little stage fright, but he had fun, liked the attention and he made new friends!" Christine Steinhauser had doubts about how her four-year-old would fare. "Ellie doesn't like loud noises, large groups of people or the unknown," she says. "But she rocked that stage—she twirled, waved, blew kisses. 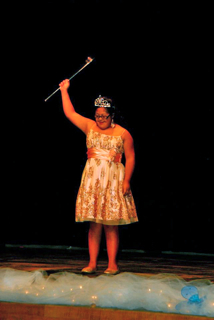 After she was crowned Queen, she decided she wasn't going anywhere and plopped right down on the floor of the stage! I finally had to carry her off so the other children could have their turn. What I found out that day was that Ellie would rather be on stage than anywhere else!" It was an "all crown" event—every kid received a trophy and crown. 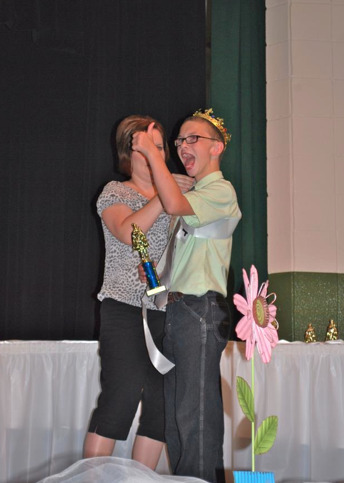 There were also personality and Most Photogenic awards handed out, and the winning king and queen got sashes. On the surface a beauty pageant, it offered a lot more to both kids and parents. "Our children endure so much in their lives, from doctors to tests, to possibly not being able to do things other kids their age do," says Christine. "This pageant was their special day to shine—they were all winners." In many ways the event was just as meaningful for parents, perhaps even more so. 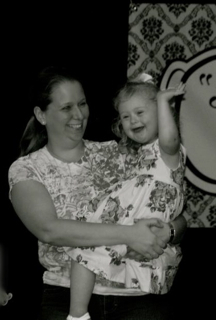 "When I found out I was expecting a little girl," Christine says, "I did what most moms do... I daydreamed about life with a baby girl. I wondered if she would like ballet, barbies, pageants, cheerleading. Like others, I've watched popular pageants on TV. Deep down, I wished I could enter Ellie but I knew their thoughts on beauty and mine as the mom of a little girl with special needs were very different. 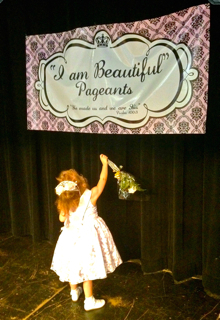 What Bonnie Williams did putting on this pageant was selfless and inspiring." 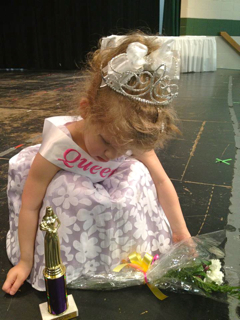 I'd love to see a mainstream pageant include kids with special needs and not call them out as such. 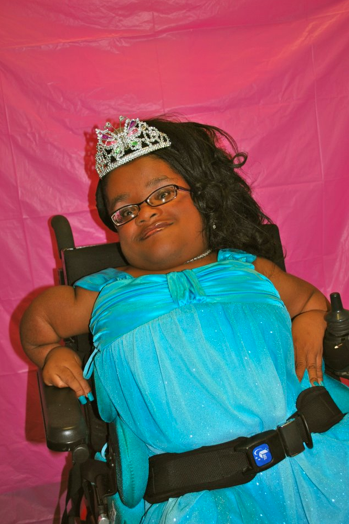 (One pageant I Googled has a Miss Special Needs category, not my idea of inclusive.) 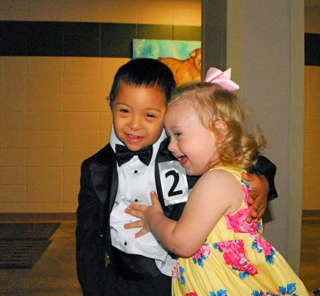 Still, typical pageants could be overwhelming for kids with special needs, and so an intimate, warm one like this is a good thing. Although there was no talent competition, Bonnie's thinking that could be added in the future. Already, she's planning a Christmas pageant, to be held December 1. Christine Steinhauser and her daughter will be there. "I think a star is born," says Christine, "although to me, Ellie's always been my star." What is a special needs trust? I didn't find out until years after Max was born. One of the hardest parts of planning for your child’s financial future is accepting that you need to plan. Dave and I procrastinated, both because we were overwhelmed with Max's day-to-day care and because, if I’m being honest, we were in denial. I felt a little reassured to hear that the financial planner I’ve been working with on this series of sponsored posts also didn't jump right on it. “I didn’t do financial planning till my daughter was 12—I was just worrying about taking care of her,” says Sal Salvo, a SpecialCare Planner with Summit Marketing Inc., a general agency of Massachusetts Mutual Life Insurance Company (MassMutual). During our most recent session, we discussed a special needs trust. I basically knew what it is but I still had a whole lot of questions. I got the complete run-down—and I'm sharing it with you. What exactly is a special needs trust? It's a way of making sure a child is eligible for all possible government benefits. According to current laws, if a child with disabilities who turns 18 has more than $2000 in their name, they won't qualify to receive certain benefits from the government. That includes Social Security Income (SSI) and Medicaid benefits such as a home health aide, therapy, work programs, daycare programs and respite programs. Parents create a “trust”—a legal way to hold assets for the benefit of another—to put money in so that their child will not have assets over $2000 in their name, and still qualify for those government benefits. For more info about SSI and Medicaid (MediCAL in California), visit the sites for Supplemental Security Income (SSI) and the U.S. Department of Health & Human Services. Medicaid rules vary by state, so it's good to check the federal site for info. You can also reach SSI at (800) 772-1213. What don’t people get about special needs trusts? I don’t think people understand how important they are! Without a special needs trust, any inheritance left to a child with special needs may disqualify that child for government benefits. What types of special needs trusts exist? 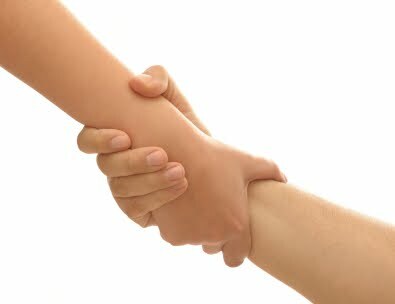 There are two main types of special needs trusts. The most common is a third party special needs trust or a supplemental care special needs trust. That trust is designed so that other people’s assets can be put into the trust—money from parents, grandparents, aunts, uncles and siblings. This allows family to provide supplemental care for a child with special needs, without jepordizing government support. 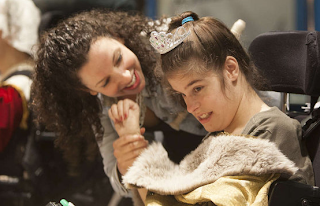 The money can go toward clothing, vacations, hobbies, furnishings and transportation and augmentative communication equipment, but not room and board. These are all things that can improve the child’s lifestyle without losing potential government support. With this kind of trust, no monies need to be paid back to the government. The second type of trust is a payback trust, which is less common. It is also known as a self-funded pooled disability trust. This is for a child who has assets, such as an inheritance, a settlement from a lawsuit, or even grandparents who set up a college savings plan. With this trust, the government keeps track of SSI and Medicaid benefits given to the child. When the child passes, the government presents a bill to the family to pay it back and the trust covers those costs. If there’s anything left, the money can go to the rest of the family. Is there anything else a trust can pay for? There are pretty tight rules but one major thing is that parents can pool resources and purchase a home for their children with special needs. 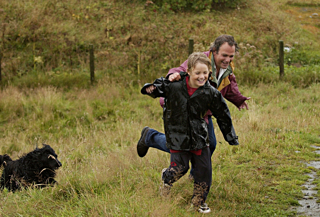 At what age should I start planning a special needs trust for my child? From an economic point of view, a trust for a child with special needs should be done as soon as possible. 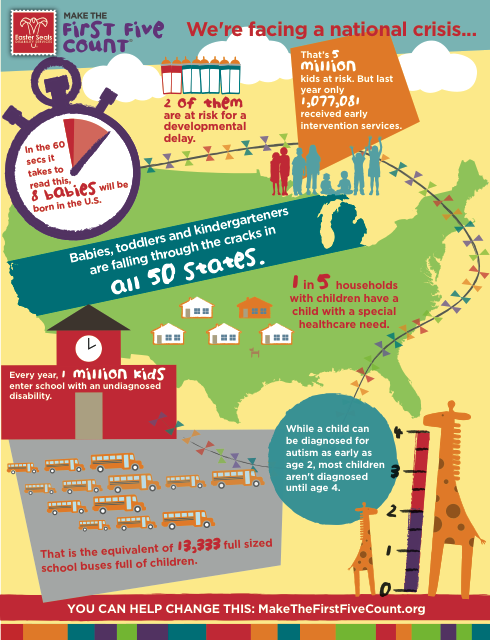 The bottom line is, a child with disabilities needs one in place by 18. By setting up a trust early (even if you don't fund it for a while), you can let grandparents or other relatives know in the event they plan to leave an inheritance. It must be paid directly to the trust, rather than put in the child's name. If by chance they pass away and leave your child money in his name, you'd have to do a payback trust (which is isn’t as attractive). So you want to get going on one early on. How do you set up a special needs trust? First, you should ideally have a total plan in place for your child that you will have worked on with a professional familiar with planning for someone with special needs. To set up the trust, you need to hire an attorney who specializes in special needs estate planning; they’ll know how to do it so your child doesn’t forfeit any benefits. A lot of people think an attorney can do anything, but think of it this way: If you need open-heart surgery, you’re not not going to a podiatrist! You need a special needs attorney. This attorney can also check to make sure that your child's assets are protected—for instance, that your 401k or pension does not list your child with special needs. Some additional resources: The Academy of Special Needs Planners and The Special Needs Alliance. Who handles the investments for a special needs trust? You will need to choose a trustee no matter what type of trust you have, someone who manages trust assets. A corporate trustee, such as a bank or trust company, can best handle this. The trust should be invested in a diversified manner, and with an investment strategy that generates a good rate of return. Some parents think it's a good idea to choose a family member to be trustee, but in some places the law forbids that and a family member might not be best equipped to handle this. Does Uncle Joe really know how to manage money and file trust tax forms, or is he better focused on caring for your child? You should, however, inform grandparents and relatives about the trust so that if they were considering leaving money to a child with special needs, they can leave it specifically to the Special Needs Trust. Disclaimer from MassMutual: The information provided is not written or intended as specific tax or legal advice, and may not be relied upon for the purposes of avoiding any Federal tax penalties. Individuals are encouraged to seek advice from their own tax or legal counsel. 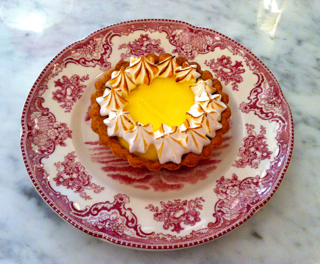 Last Wednesday, I returned to my old life, the one before I had kids. The lightning bolt of sadness that struck came from out of the blue. What I did was spend a day in Hoboken, NJ, where I lived for 10 years after college. I've been back a couple of times since we moved, but usually with the kids and rarely at leisure. This time I was alone, with an afternoon babysitter and no plans whatsoever. First I had lunch with my friend Theresa, a rare two-and-a-half hour blabfest. Afterward, I wandered around aimlessly, amazed at how built up the downtown area had become: single homes razed for apartment buildings, a fancy W hotel, a bank transformed into the most majestic Wal-greens ever, an entire new transit line. But some of my own landmarks remained: The bar where I used to go hear bands play, the sandwich shop where the guy behind the counter started making my turkey-mozarella-roasted-red-pepper sub as soon as I walked in, the salon where I got a manicure on the snowy day before our wedding, the intersection where Dave crashed my Toyota Corolla (he was fine; Toyota, totalled). 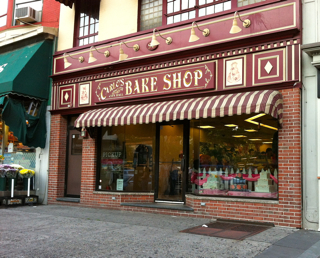 I used to get birthday cakes here, before Buddy Valastro was Cake Boss. 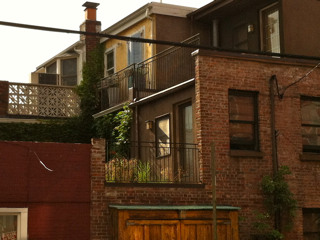 I always loved this little terrace; Hoboken is full of cool hideaways. The cell phone ring interrupted my nostalgia, especially because it was the babysitter. When she picked up Sabrina from school, she'd run over some gravel and now the minivan had a flat. One and a half blocks: Explain situation only to realize I have no clue whether our Toyota Sienna has a donut. Realize that I may be older but that doesn't necessarily mean I am wiser. Half block: Call Dave at work. We have run-flat tires. No donut. He'll handle it. And then, back to my past. I made my way uptown. 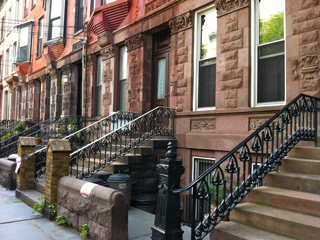 The brownstones looked as stately as ever, the towering oaks welcoming with their shade. Things were so familiar—and yet, they weren't. I was looking at them through very different eyes. I'd lived a whole other lifetime in the decade since leaving Hoboken. I found the strangeness of the familiar even more disconcerting than the newness I'd seen downtown. I thought back my twenties, when so much was unknown. What would happen with my career? Who would I marry? Where would we live? What would our kids be like? 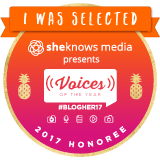 We moved out of Hoboken when I was five months pregnant with Max, and I felt a pang of regret for that me who had no idea what lay ahead. I could never have imagined my baby would have a stroke. Who'd imagine that? I try not to wallow in Max melancholy. I did it all the time when he was younger: I'd wonder why my child, why me. That first year of his life was one big pity party. Even as I'd sit on the sofa and cuddle Max, my tears would drip down onto his cheeks. But now I know: My beautiful boy is no tragedy. Maybe I couldn't have imagined having a kid with cerebral palsy, but I couldn't have imagined having kids as amazing as Max and Sabrina, either. No parent ever knows what they're signing up for. I shook off the sadness and walked on. 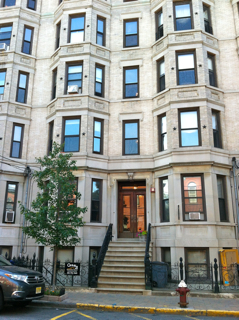 I walked past the building Dave and I lived in, and headed to the block of my first apartment. For eight years I shared it with a revolving door of roommates. A retired neighbor named Pepe was a permanent fixture on the stoop next door. Pepe was my parking saint. 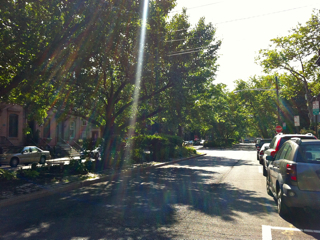 Hoboken has alternate side of the street parking, which means that on Mondays (or was it Tuesdays?) in the neighborhood you couldn't park on one side of the street so the town could clean it, and on Wednesdays (or was it Thursdays?) you couldn't park on the other side of the street. It was quite the scramble to find parking on alternate-side mornings. Sometimes I'd still be circling the block at 8:30 a.m., desperately trying to snag a spot and get to work on time. Then Pepe and I came up with a system. Starting at 7:45 he'd keep an eye out and if a "good" spot opened he'd stand in it and hold it for me; I'd buy him a lottery ticket as his fee. Finally, a parking garage opened and I was literally one of the first people to sign up. Every so often, though, I'd still get Pepe a lottery ticket. As I got closer to Pepe's stoop, I was nervous. Pepe was pretty elderly back when then. What if he was gone? But as I neared I saw him sitting there, as if he'd never budged. "PEPPPPPPEEE!!!" I said. I gave him a hug and we caught up some. I told him Dave and I had two kids, Max and Sabrina, and showed him photos. Pepe admired their cuteness and asked what they were like. I hesitated. Should I tell him about what happened to Max? The cerebral palsy? No, I decided, that wasn't necessary. And so I told him how fun-loving and good natured Max is, like Dave, and of his love for Disney World and all things purple and chocolate ice-cream. I told him how feisty Sabrina is, how much she likes spelling and playing the violin and softball. "They make me so happy," I told Pepe. After we said goodbye, I walked down to the train station. And then I rode home to my lovely life. 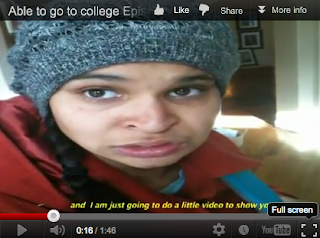 Video inspiration from a young woman with CP: The unstoppable AZ of AZ is Amazing has been chronicling her first year at university in the series Able To Go To College. Check out her latest video (and the first one, too). A worthy campaign to create children's books: The ever-amazing Shasta from Outrageous Fortune—mom to twins Jaden and Malachi, who has CP—is writing Dark & Light, simple board books aimed at very young children inspired by ones her kids loved. 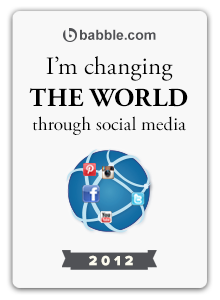 Here's her Kickstarter campaign. Healthcare and disability: Why does the national discussion about healthcare so rarely focuses on disability? Excellent article over at Salon on the topic (thanks to Julie for sharing it). World's easiest pasta! OK, in the scheme of things it doesn't take much to whip up pasta (which I know very well, because it's a basic food group for Max). 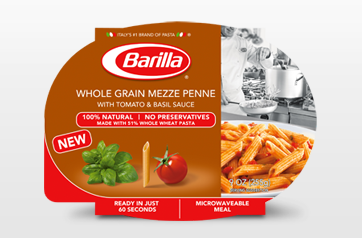 But Barilla's Microwavable Meals are a total no-brainer. Made of natural ingredients, you store them on a shelf and they heat up in a minute. Barilla sent us some to try, and they are genuinely tasty. Max particularly loves the Whole Grain Mezze Penne with Tomato & Basil Sauce. They run about $3.30 a package (and there's a $1 coupon here). A woman denied a transplant for being intellectually disabled dies: Misty Cargill, an Oklahoma woman with intellectual disability, died last week at the age of 30. She was on a list for a kidney transplant. She'd first made headlines back in 2006, an NPR post notes, when Oklahoma University Medical Center turned her down because they did not believe a woman with ID had the mental capacity to decide on a transplant. Yet another troubling case of discrimination against people with special needs. Sorry, I don't have an update for Amelia Rivera, the little girl with Wolf Hirschhorn syndrome denied a kidney transplant by Children's Hospital of Philadelphia because a doctor said she was "mentally retarded." (Last I heard, the hospital apologized and was assessing a transplant). Gotta-know info: Sabrina has been poring over the latest Big Book of What?, which I received for review, and sharing it with Max when the spirit moves her. 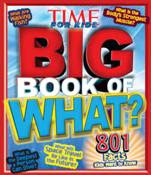 It's 192 pages of colorful photos and eye-openers, with kid-friendly answers to questions like "What is a ghost town?" and "What is a boomerang?" and "What is a solar eclipse?" I adored these sort of books as a child, and this one's particularly fun and fascinating. And from my Babble blog: Ever been a Pregzilla? Roar if you relate. Happy early Father's Day, honey! 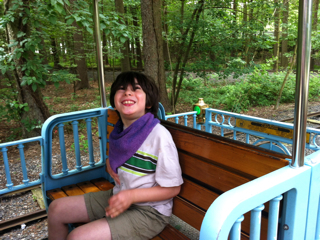 This guest post is by Halfdan W. Freihow, a father of four whose youngest, Gabriel, has autism. 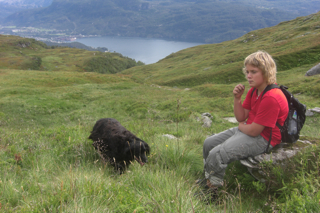 The family lives on an island in southern Norway. 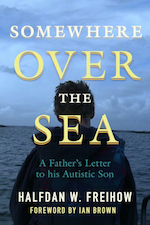 Halfdan's memoir Somewhere Over The Sea: A Father's Letter To His Autistic Son is out this month; Publisher's Weekly called it "poetic." Honest, confessional and loving, the book is not afraid to go there: Freihow ponders Gabriel's differences from other kids, his sense of isolation as a dad and his grief, along with the triumphs and highs of parenting a child with autism. The author's worked as a publisher, reporter, translator and literary critic—but he's one very accomplished, inspiring dad. I’ve been the father of Gabriel, an autistic child, for 18 years. Or rather: I used to be the father of an autistic child. These days my son would disagree forcefully, and be quite right to do so, because the child has become a young man, virtually an adult. These are a few of the many things that have surprised and intrigued and amazed me as the father of a special needs child. My wife and I have three other children, all of them older than Gabriel, so I know a few things about kids growing up and suddenly having grown out of reach. They remain loved and loving sons and daughters, but they go on to live their own lives, no longer in need of what we like to think of as our indispensable parental guidance. With Gabriel the transition seems so much more intangible. Yes, he’s eighteen and legally of age, but … you know, he’s still Gabriel. For so long I’ve conditioned myself to think of him as infinitely more vulnerable and in need of his parents’ help and advice than his siblings, that I somehow resist the thought of letting him go, of him venturing out into the world unaided. Even if I know that he has to, and probably is better prepared for it than I’m willing to admit. 2. Sometimes you just have to say "What the hell"
One of the greatest and most pleasantly surprising byproducts of having a special needs child has for me undoubtedly been a gradual getting used to not caring so much. I am by nature a reasonably responsible man, eager to do things properly and orderly. But life with Gabriel has been everything but orderly. The unexpected and the (not always welcome) turbulent have been the rule rather than the exception. And still – it’s been fine! I’ve been taught that most of the things I used to require and expect don’t really matter much. They’re the icing on a cake that tastes just as good without it. I’m getting steadily better at not worrying, at thinking "what the hell" when things don’t go as planned, at simply being satisfied. Gabriel is a really bad liar. He just can’t do it convincingly. Not because it worries him that would be doing something morally wrong, but because (I imagine) the world seems way too complicated for him as it is. If he were to put himself in a position where he needed to handle several versions of reality, he would probably collapse under their weight. Consequently, he doesn’t beat around the bush, but says it all straight out. It isn’t always easy to explain to strangers when he walks up to someone on the street, saying ‘Why don’t you eat a bit less, since you’re so fat?’ but it sure is liberating. The lesson I’ve learnt? That honesty and frankness doesn’t really hurt, not by far as much as all the insincerity that constantly surrounds and bombards us. Like most people around me, I grew up with the belief that mine was one of the most tolerant and open societies in the world. And relatively speaking, it probably is. But being Gabriel’s father has taught me how shallow that alleged tolerance is. Like, it’s OK to be different or make out of the ordinary choices, as long as they’re different or out of the ordinary in the way we’ve agreed to accept. It has really been quite shocking to discover that under that thin veneer of acceptable differentness, people’s capacity for tolerating social aberration (i.e. tolerating Gabriel’s unconventional behavior) is sadly poor. On the other hand, living with Gabriel’s special needs and ways has again taught me that there’s no need to worry when confronted with the abnormal, whether physically, mentally or culturally. I know now that it’s just another way of being normal. I am not a particularly aggressive person, and I don’t very easily or very often get angry. But with Gabriel I’ve seen my rage unleashed in ways that have startled me. Occasionally it has been directed at him, when sleeplessness and fatigue has worn me out and he picks the moment to create havoc at home. But that is rare. Far more frequently it has been directed at the others, those who make his difficult life even more difficult, if not unbearable, by their sheer unwillingness to make room for somebody whose behavior they consider unacceptable. Their selfishness and stupidity, really (I feel the anger rising just writing about it), because their idea of a perfect world is one where everybody is just like them. Of all that has surprised me being Gabriel’s father, the most astounding has been the peculiar and (why not admit it) flattering attention I have attracted from women. Who would’ve thought? From the time when I went to the park with him in a baby carriage until today, when we might sit down for a drink together at a café, it has amazed me how women, once they realize that Gabriel has special needs, become visibly interested in me, if not outright flirtatious. As if my being so obviously a proud father of a special child made me, too, special and attractive. I never fail to report these encounters to my wife when I get home, for they remain the only occasions when she doesn’t draw more attention than me. But in the end it all comes down to love. My wife and my other children are a constant source of joy and love, but I would be lying if I claimed that there wasn’t something special with Gabriel also in this regard. Because of his needs and his social deficiencies, he has carved the well I draw my love from to depths I didn’t know existed. That is his true gift to me, the one that enables all the others to shine. While I would have done anything to spare him his troubles, I am sincerely convinced that life with Gabriel and all that sets him apart has made me a man better equipped to love and care for others than I would’ve been without him. For all this, I am deeply grateful. 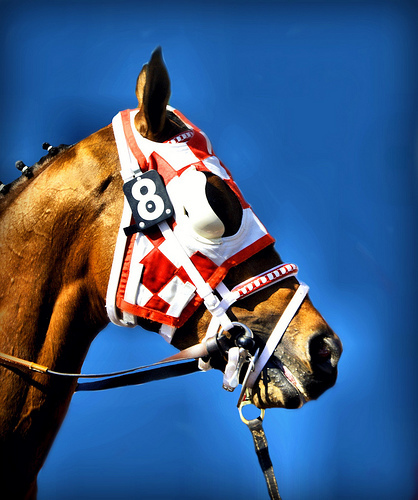 Like a race horse, I power through life with blinders on. Special needs mom blinders, actually. They help me keep my focus on Max, avoid comparing him to other kids, and not obsess about problems that may lie down the road. This, I've learned after putting my heart through the paces again and again when Max was younger. It only bred anxiety. Will he go to college? Will he have a good job? Will he be a dad? STOP IT STOP IT STOP IT, I'd tell myself. Eventually, I listened. I can do my best to help Max reach his potential, but no good comes of chasing answers to what he will be "like" and what he will/won't be able to do. And so, I don't let myself think too much about challenges the cerebral palsy and brain damage may someday present. Oh, yes, I know that Max is going to be at much higher risk for seizures when he reaches teenage-dom and his hormones go wild. I know, from last summer's serial casting, that as he spurts up his leg muscles are going to keep on tightening and perhaps other ones as well. But with my trusty blinders on, I keep my sights on Max in the here and now. The major problem with wearing blinders is that when they get knocked off, you might just freak out. That right foot Max got serial casted has started to turn inward again. His physical therapist at school noticed it first. One day as Max was walking around the house, I saw his right foot going crooked and my heart lurched. Max was due for a new set of orthotics, though, and his therapist and I hoped they'd do the trick. He's been in the new orthotics for a couple of weeks and I thought I saw improvement, but not consistently. Then I got an email from his PT. She's been watching his leg closely, she told me, and she thinks the problem with his foot turning inward is starting at his hip. The therapist said it was nothing to be alarmed about, and that she just wanted to keep an eye on it and prevent it from getting to be more of an issue as Max grows. I was totally unnerved, and scared. It was a new body part to worry about, another way the cerebral palsy may cause trouble. I handled it in my usual way of dealing: take action. I'm trying to get an a.s.a.p. appointment with the physiatrist. I've Googled hip problems and cerebral palsy. (Says Children's Hospital of Boston, "Weak muscles do not support the bone and joints as well as they should, which can lead to scoliosis, hip dislocation and foot and ankle deformities.") Also, I ate too many Oreos. I'm trying to not let worry get the best of me. Only my blinders are completely trained on Max's right hip. Is it moving well? Is it off? What's a hip supposed to look like, anyway, when it moves? And is that foot straight or crooked? Oh, sweet boy, please be OK.
Got Early Intervention questions? An expert is here to answer them! I remember very clearly when I first learned about Early Intervention. Max was a week old, and I was talking with the social worker in the NICU. I had lived many lifetimes in the days since he was born, and my head was finally in a place where I could start looking ahead. This woman told me about therapy services the government provided to kids with special needs; she'd looked up our local EI, and handed me the phone number for the coordinator. I called the same day. 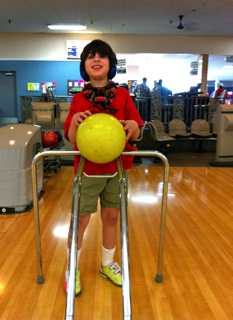 Within a month, Max was getting physical therapy. 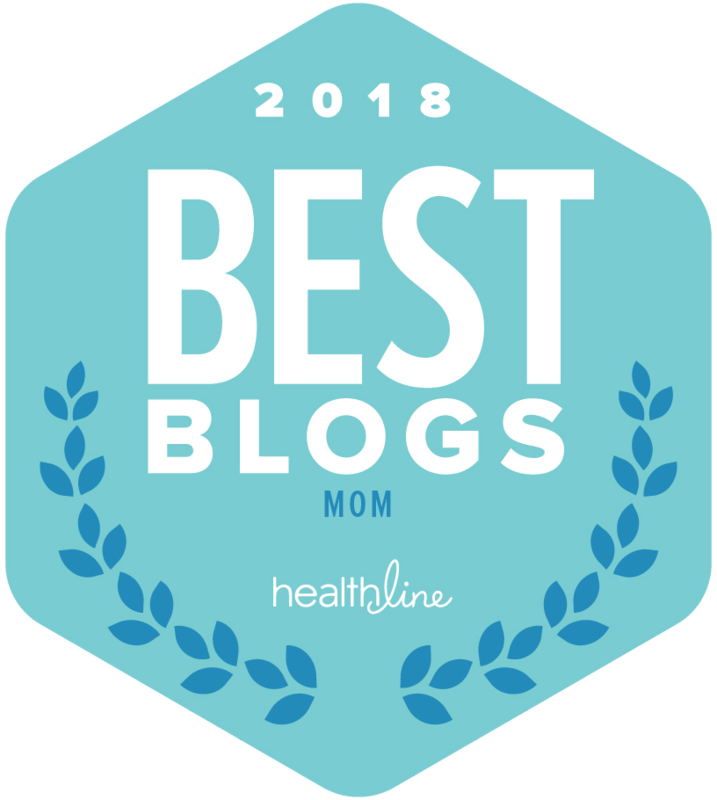 I credit the therapies Max got through EI with spurring him to crawl on all fours and eventually walk; improving his grasp and generally giving his fine-motor skills a boost; encouraging him to make sounds; and much, much more. Five years after he finished it, I am still grateful for what EI did for hi, and I will forever will be. Sadly, a lot of kids who need EI aren't getting it—which is where Make The First Five Count comes in. An Easter Seals initiative, it's all about the need for detecting developmental delays and getting kids treatment before age 5, a critical period for development. Each year, more than 1,000,000 kids with unidentified disabilities and delays enter school with learning and health issues that put them far behind their peers. "Pediatricians and childcare providers can help, but there's a lot of room for improvement," says Patricia Wright, Ph.D., M.P.H., National Director, Autism Services and Programs, Easter Seals, who's worked for people with disabilities for 29 years. "Right now, there are about 340,000 kids in EI nationwide," she says. "We think about 1.6 million kids could be eligible, based on data, but aren't yet." Easter Seals now has a free online Developmental Milestones Screening parents can fill out online to see if kids ages 1 month to 5 years old are developing on time. The questionnaire is endorsed by the American Academy of Pediatrics and funded by CVS Caremark, with whom I've been doing work, through their foundation the CVS Caremark Charitable Trust. It takes just 10 to 20 minutes to complete and you get results within two weeks, along with tailored information if necessary (based on your zip code) about local EI services. "This screening is for everyone—not just for parents who think there's an issue," says Wright. "You'll find out if your child is hitting social, emotional, physical and intellectual milestones, or not." And if your child needs EI? Well, consider yourself lucky. "We know that if you intervene at age 2, a child will have more success than if an intervention is done at age 6," says Wright. "Kids have so much opportunity for learning in those young years—their brains are so malleable. The delay gap is so much smaller when they're young. Better to get in there and help!" How did you first find out about Early Intervention? Do you have any questions about EI? Patricia Wright is ready to jump in and answer them! Saturday morning, Max woke up, swung his arm back and forth and stared at me, expectantly. Bowling. He wanted to go bowling. "Oooh-aaay?" he asked. ["Today?"] This understanding of today vs. tomorrow is new to him in recent months. And of course, he wants everything today. Like the other day, he woke up and asked about going on another Disney cruise. Oooh-aaay. Bowling was a lot more do-able. 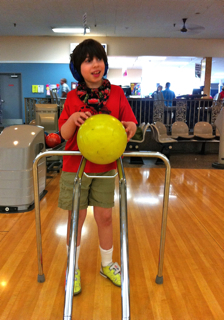 Max has been to a bunch of birthday parties at bowling lanes in recent months and had a great time. He's also into the app Gutterball: Golden Bowling Pin, which I like because it's encouraged him to use his pointer finger. And so, Max and I went bowling, and I even remembered to bring the noise-blocking earphones. When we got there, Max tried to crash some kid's party, but I lured him away and soon we were decked out in super-chic bowling shoes and the nice lady behind the desk hooked us up with a ramp. Turns out that Max wasn't psyched to see my name on the screen. No, he wanted his best bud's name, so up it went. 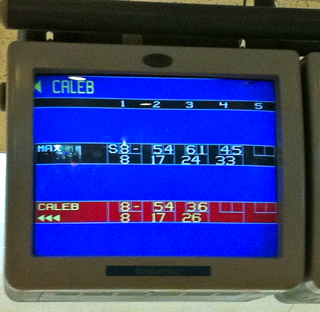 Max bowled for two—him and Caleb, taking up both turns. I'd lift the ball onto the ramp for him and he'd push it mightily then stare, hopefully, as it rolled along. He squealed each time he got a bunch of pins down, and I did, too. We had ourselves a great date.